The paint synthesizer has a large number of different editable parameters that control the look and feel of a given paint preset. A common getting started question is how to adjust the opacity of the current paint preset. This post explains how to adjust the opacity of a paint preset using the associated controls in the paint synthesizer. The paint synthesizer’s editable parameters are adjusted in the Editor palette. The Editor palette is a generic editor that is context sensitive to Studio Artist’s main operation modes. When you are in Paint Synthesizer Classic Operation mode you can manually or automatically paint using the paint synthesizer and it’s associated Editor adjustable parameters. The adjustable popup at the top of the Editor lets you choose between the different control panels available for any given operation mode. When in paint synthesizer classic operation mode this control panel popup displays the different paint synthesizer control panels. To adjust the paint opacity you will want to select the Paint Fill Apply control panel. There are 2 different adjustable parameters you can use to adjust the paint opacity. The Blend % control is the one you will typically use. This adjusts the blend of paint applied to the canvas. By decreasing the Blend % parameter you are reducing the amount of paint applied to the canvas, so the paint will appear lighter. The Blend Mod parameter lets you apply a modulator to the Blend % setting. The modulator will modulate the blend of the application of paint onto the canvas from 0 to the specified Blend % setting. A common blend modulator is Path Pressure. Selecting this Path Pressure modulator option for the Blend Mod editable parameter will let you interactively modulate the paint blend based on your pen pressure when using a pen and tablet. There are a large number of different Blend Mod options. You can edit your paint presets to interactively modulate the blend based on pen pressure, tilt, tilt orientation, path length, and many other options. There’s also a Transparency % parameter available on the Paint Fill Apply control panel. This control lets you add additional true transparency to your paint independent of the blend setting. Studio Artist’s painting engine tries to simulate the effect of applying nibs of paint on a brush to a canvas. The Blend control is working at that level of the physical paint on canvas simulation. So this is typically the control you will want to adjust to lighten up on the amount of paint being applied to the canvas. And this is the reason why the interactive modulators like pen pressure work with modulating the Blend. The Transparency control provides a second level of true transparency adjustment. Adjusting this control will give you a transparency adjustment for your paint that is separate from the recursive mixing occurring at in the physical simulation of paint-canvas interaction going on in the paint synthesizer. However,this control does not take the recursive paint mixing into account like the blend control does, so adjusting the transparency is not going to be as natural an effect as adjusting the blend for wet paint presets. This is the reason why you modulate the blend setting with pen pressure if you want to build a pressure sensitive paint preset. The Replace Composite option assumes a 100% Blend, so the Blend % and Blend Mod controls vanish from the Paint Fill Apply control panel if you have the Composite control set to Replace. 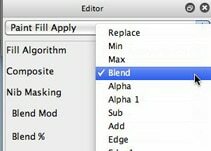 If you change the Composite setting to Blend then the Blend controls will reappear. 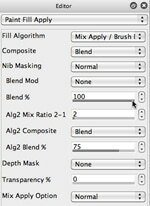 Blend % is available for all of the Composite settings except for Replace. The Composite control lets you choose the particular compositing algorithm used to combine paint onto the canvas. Compositing algorithms are sometimes called transfer modes in other graphics programs. A compositing algorithm takes 2 images as input and combines them together in some specified way. Blend compositing linearly mixes the 2 images (paint and canvas being the 2 images in this case). Min compositing is a nonlinear kind of compositing that outputs the darkest pixels from the 2 input images. It’s useful to simulate some watercolor paint effects where the application of additional paint onto a canvas only darkens what is already marked on the canvas.